Neurocristic cutaneous hamartoma (NCH) of the scalp, a rare lesion, presumably results from aberrant development of neuromesenchyme. Its elements reflect the spectrum of differentiation inherent in neural crest-derived cells. To our knowledge, in the English literature, very few examples of NCH have been reported, ,,,,,,,,, most of them located in the cephalad region. ,,,,,, Herein, we report another, emphasize its diagnostic importance, and review the literature regarding this distinctive clinicopathologic lesion. A 2-month-old girl born of non-consanguineous parents was noted to have a right occipital scalp swelling since birth. It had been biopsied elsewhere, but the procedure was terminated due to excessive bleeding. On examination, a firm 6 × 6 × 2 cm well-defined, right parietooccipital swelling was noted, as was a healing biopsy site. No underlying bony defect was palpable. The anterior fontanelle was lax and pulsatile. The lesion could not be transilluminated. No cough impulse was noted. There were no focal neurological deficits. A general physical examination disclosed no stigmata of neurofibromatosis types 1 or 2, or of neurocutaneous melanosis. The computed tomography (CT) scan of the brain [Figure 1] showed a large, well-defined, contrast-enhancing, extracranial swelling of the right parietooccipital scalp unassociated with an abnormality of underlying calvarium. Both brain parenchyma and the ventricular system were normal. An ultrasound study of the abdomen showed no abnormality. The child underwent a near total excision of the mass. At surgery, the purely extracranial nature of the mass was confirmed. It was firm and vascular. The underlying bone was normal. The postoperative course was unremarkable. At a 4-month follow-up, no abnormality was evident. Grossly, the cut surface showed an ill-circumscribed lesion that was smooth, white and soft with a myxoid appearance. The overlying skin was intact. Histologic examination disclosed fibrous tissue containing well-defined lobules and nests of spindle-shaped cells forming whorls and bundles cytologically appearing schwannian in nature [Figure 2]a and b. Immunohistochemical studies (streptavidin-biotin peroxidise complex method) showed the cytoplasm and nuclei of these cells to be S-100 protein (Dako, Carpinteria, CA, USA, polyclonal, 1:200) reactive. 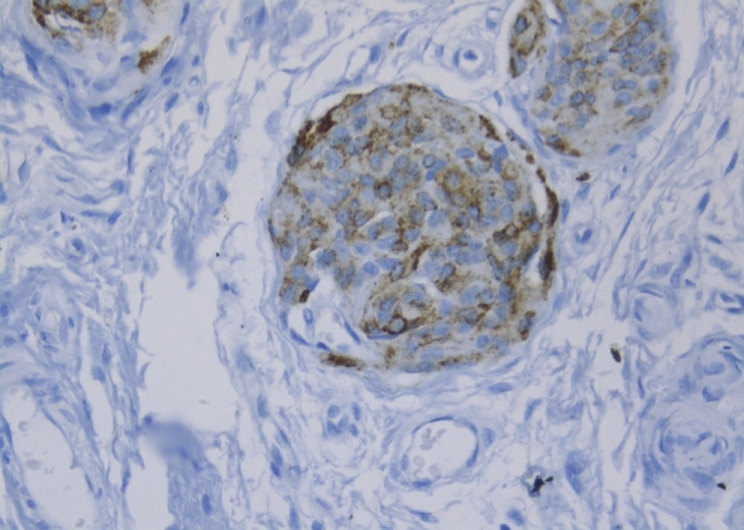 Membranous staining for collagen 4 (Dako, monoclonal, 1:50) was also noted. Focal positivity for CD57 (Novocastra, monoclonal, 1:50) and CD34 (Dako, monoclonal, 1:50) [Figure 3]a-c was evident as well. There was no staining of these cells for epithelial membrane antigen (Dako, monoclonal, 1:50), and HMB-45 (Dako, monoclonal, 1:50). Surrounding these nests and merging with them in areas were plump, fusiform cells with oval nuclei, and eosinophilic cytoplasm HMB-45-positive [Figure 4]. A few such cells had shown features of delicate cytoplasmic Fontana-Masson positivity. In areas, the stroma was loose and myxoid, contained delicate vascular channels, minute nerve fascicles, and occasional lobules of adipose tissue. Alcian blue-positive, the stroma was also rich in CD34-positive cells [Figure 5]. The lesion was largely schwannian in character, but contained neurofilament protein (Dako, 2F11, 1:600) immunoreactive axons as well as cells cytologically resembling both melanocytes and nevus cells. Nuclear atypia was absent; the MIB-1 (Dako, 1:20) proliferation index was <1%. There was no evidence of malignancy. Cutaneous adnexae were not present within the lesion. The diagnosis of NCH was confirmed. NCHs are unusual, pigmented skin lesions featuring dysplastic neural crest-derivatives. , The neuromesenchymal properties of their constituent cells are reflected in the terologous differentiation manifested by these tumors. No genetic disposition has been observed. Congenital lesions may initially be macular, pigmented cells being either numerous or absent in some cases. The clinical importance of NCH lies in their potential for misdiagnosis , as well as their capacity for malignant transformation over time. , The latency to development of malignant melanoma in NCH appears to depend, in part, on whether the lesion is congenital or acquired. Given the unpredictable occurrence of malignancy, some 15-67 years (mean, 32) after the identification of a congenital lesion involving the head, neck, or back and between 1and 6 years (mean, 3.5) in acquired NCH in the series of Pearson et al.,  long-term cancer surveillance is recommended in all NCH patients. Histologically, NCH consists of a combination of elements, including nevomelanocytes, pigmented dendritic cells, Schwann cells, spindle cells, and fibroblasts thus underscoring the pluripotent nature of neural crest cells. ,,,,,,,, In addition to a dermal melanocytic component, these tumors can contain neurosustentacular and neuromesenchymal components. ,, Aside from our own, we are aware of only two other previous reports of nerve fascicles as a component of NCH. , Dermal melanocytes are present in NCH, but are unassociated with a junctional element. The same is true of cellular blue nevi, which also lack a junctional component. Both these lesions are principle differential diagnoses of NCH with prominent melanocytes. ,, The lesion described herein was entirely subcutaneous, there being no connection to overlying skin. 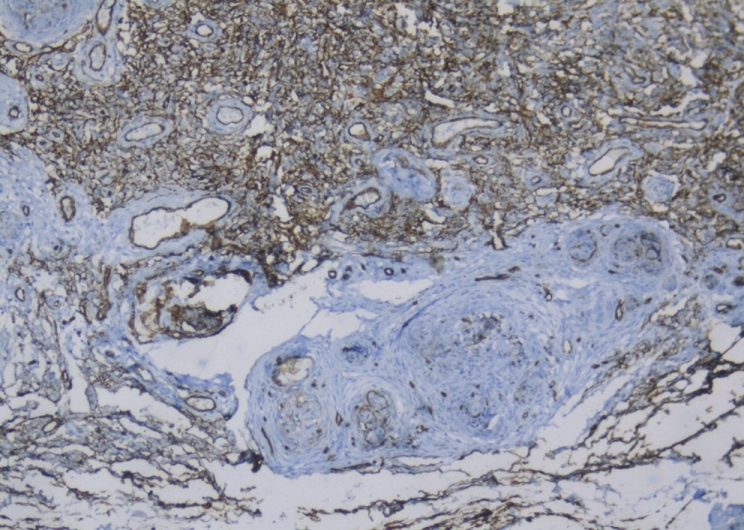 Histologic criteria and immunohistochemical staining patterns are useful in differentiating NCH from blue and congenital nevi as well as from nerve sheath tumors. NCH stain positivity for S-100, CD57, HMB-45, Melan A, collagen 4, and CD34. The surrounding stroma in NCHs, as well as the areas with schwannian differentiation, shows increased CD34-positive cells. Increased CD34 staining is seen in neurally derived tumors and may mark a subset of endoneurally derived cells. Congenital nevi do not show stromal staining for CD34, and although congential nevi may have melanocytic clones that do show positive staining with HMB-45, staining is not diffuse, as in NCHs. Neurofibromas and schwannomas are also considered differential diagnosis but the presence of abundant mast cells within diffuse neurofibroma-like areas, and the overlying epidermis showing marked epidermal hyperplasia and papillomatosis are differentiating features. The real significance of the diagnosis of NCH lies in its biologic behavior. Although only a few examples have been reported, a significant number of NCH have acquired a malignant melanocytic component, , but our tumor did not. Malignant elements are situated either in deep dermis or in subcutaneous tissue and are unassociated with a junctional component. Most are circumscribed and often multinodular; these melanotic tumors consist of small, cytologically bland, round to oval, spindled cells, in part, exhibiting a trabecular or nested pattern of growth. Nuclear palisading and perivascular pseudorosettes have been present in several examples. Although some show malignant features, including infiltration of deeper structures,  presence of subepidermal nodules,  and high mitotic indices,  our tumor did not. 1. Smith KJ, Mezebish D, Williams J, Elgart ML, Skelton HG. The spectrum of neurocristic cutaneous hamartoma: Clinicopathologic and immunohistochemical study of three cases. Ann Diagn Pathol 1998;2:213-23. 2. Bevona C, Tannous Z, Tsao H. Dermal melanocytic proliferation with features of a plaque-type blue nevus and neurocristic hamartoma. J Am Acad Dermatol 2003;49:924-9. 3. 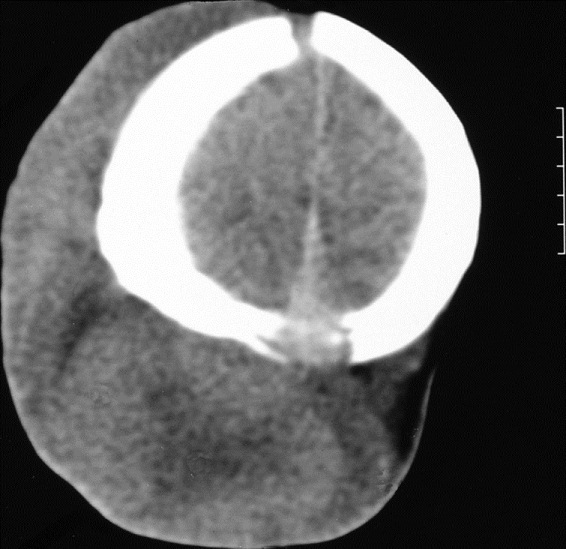 Conrad DM, Chaplin A, Walsh NM, Pasternak S. Extensive neurocristic hamartoma with bone marrow involvement. Am J Dermatopathol 2010;32:486-8. 4. Crowson AN, Magro CH, Clark WH. Pilar neurocristic hamartoma. J Am Acad Dermatol 1996;34:715. 5. Karamitopoulou-Diamantis E, Paredes B, Vajtai I. Cutaneous neurocristic hamartoma with blue naevus-like features and plexiform dermal hyperneury. Histopathology 2006;49:326-8. 6. Kim SK, Kim YC. Neurocristic cutaneous hamartoma of the scalp. Ann Dermatol 2009;21:396-8. 7. Mezebish D, Smith K, Williams J, Menon P, Crittenden J, Skelton H. Neurocristic cutaneous hamartoma: A distinctive dermal melanocytosis with an unknown malignant potential. Mod Pathol 1998;11:573-8. 8. Pathy AL, Helm TN, Elston D, Bergfeld WF, Tuthill RJ. Malignant melanoma arising in a blue nevus with features of pilarneurocristic hamartoma. J Cutan Pathol 1993;20:459-64. 9. Pearson JP, Weiss SW, Headington JT. Cutaneous malignant melanotic neurocristic tumors arising in neurocristic hamartomas. A melanocytic tumor morphologically and biologically distinct from common melanoma. Am J Surg Pathol 1996;20:665-77. 10. Tuthill RJ, Clark WH Jr, Levene A. Pilar neurocristic hamartoma: Its relationship to blue nevus and equine melanotic disease. Arch Dermatol 1982;118:592-6. 11. Reis-Filho JS, Milanezi F, Ferro J, Schmitt FC. Pediatric pigmented dermatofibrosarcoma protuberans (Bednár tumor): Case report and review of the literature with emphasis on the differential diagnosis. Pathol Res Pract 2002;198:621-6. 12. Denlinger CE, Slingluff CL Jr, Mihm MC Jr, Patterson JW. Extensive neurocristic hamartoma with skeletal muscle involvement. J Cutan Pathol 2007;34:634-9.